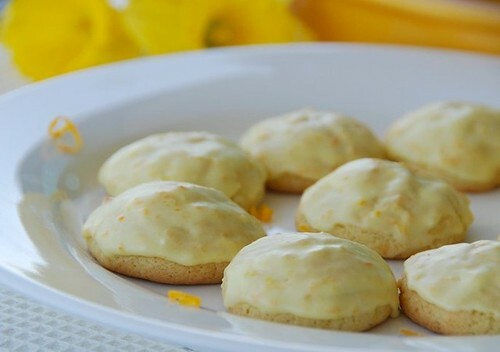 Delight your friends and family with a batch of frosted orange delight cookies from Anita Chu's Field Guide to Cookies. I have made several of Anita's cookies, and these are by far my favorite: they're moist, light, and refreshingly tangy, which makes them the perfect spring and summer cookie. As many of you already know, I'm currently writing A Field Guide to Sandwiches, which will part of the same popular series for which Anita has written. I want to send a BIG thank you to everyone who has so kindly wished me well. You always brighten my days. Also several people have emailed me asking if I'll need recipe testers. Yup! I sure will. I'll post an announcement for it when the time rolls around, so you can test (and eat) some delicious sandwiches if you'd like. In the meantime, eat your cookies. Sift flour, baking powder, baking soda, and salt into a medium bowl and set aside. In a stand mixer, cream butter and sugar on medium speed for several minutes until light and fluffy. Add the egg and orange zest and mix until combined. Add flour mixture and orange juice in three additions, alternation between the flour mixture and the juice. Drop tablespoons of dough onto an ungreased cookie sheet at least 1 1/2 inches apart. Bake for 8-10 minutes. Remove and allow to cool on wire racks for at least 30 minutes before frosting. For the frosting: In a stand miner, cream butter and sugar at medium speed for several minutes until light and fluffy. Add orange zest and juice, and mix until smooth. Frost cooled cookies using using a mini rubber spatula (or as I did, my index finger). Fantastic! These delightful little cookies look wonderful! Those look and sound really really good! I love all that zest in the frosting. These do look light and refreshing! I rarely make cookies, but I certainly enjoy citrus flavoured ones. The frosting is a nice touch! 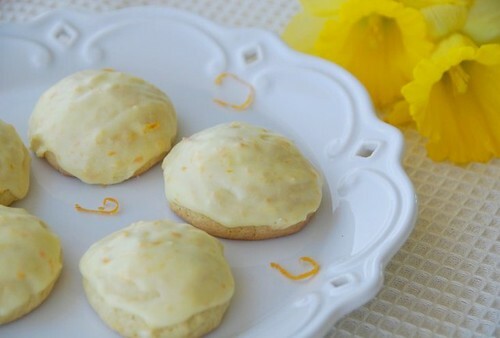 Citrus based cookies are the best! This recipes seems pretty easy to make vegan too, I definitely want to try it. Good luck with your cookbook by the way! Mmm, these look delicious! Looking forward to your upcoming sandwich posts! These cookies look great and remind me I need to buy the book. Looking foward to your sandwich version! Definitely delightful. We tried making something similar, and our icing didn't set as nicely as yours. Perhaps we should try try again! I love cookies like this for their bright flavor. Perfect for summer, or even in the winter when you need a taste of summer! I love orange flavoured cookies especially with the frosting. I love orange cookies and cupcakes. So fresh- and not-too-sweet. And congrats on the book project! Wonderful. I do not bake many cookies, but the ones with the orange, yes for me!! These are beautiful! lisa-Then this is one you should definitely try. wheelerscrew-Thank you. I appreciate that. snooky-Yeah. Sometimes we need a change from the 'ol choc chip. duodishes-This frosting was really easy and went on beautifully. ivy-The frosting is so good. lydia-I usually do lemon too, but the orange is just as lovely. soma-Orange cookies are really wonderful. My husband has this thing where he won't eat oranges (something about how he was traumatized as a child by how sticky and gross they were at soccer practice or something - what a wimp! ), but I think I'm just going to make these for myself. They look so yummy and perfect for the humid weather! These look SO good! And for whatever reason, I'm on a citrus kick right now so these are going to the top of the list! Yum!!! I'm so out of the loop, Susan - I did not know about the book, congratulations, darling! You deserve the success! hello suzan.. your cookie sound delish.. specially the frosting.. i love orange cookies. gonna try this out this week end. m sure my kids gonna hug me for this yummy cookies. thanx!! I love orange flavor--whatever contains orange always taste great for me. Another delightful cookie to add to my growing list of "must try" recipes. They look perfect for summer. Eat your cookies indeed! Love iced cookies. I'm always impressed with icing on a cookies - somebody's gone the extra mile. You're probably right, summer and orange sound just perfect. Very much look forward to your sandwiches!! What I love here is the use of the orange zest, which I can easily see in the frosting. Congrats on the book! My husband ear's absolutely perked up when I mentioned a field guide to sandwiches, so you have us absolutely rapt. And those cookies right there - orange isn't used often enough. They look beautiful. What a cool sounding cookie! I will be making this soon! Lovely cookies! Perfect for a summer outdoor party! kara-Then you're gonna love these! patricia-I always think of you when I make citrus desserts! nora-Let me know how they turn out! thip-I never turn down orange flavored goodies either. cookiefan-They should definitely make the list! tanna-Gone the extra mile. I like that. Thanks! anali-The frosting is so good. haleysuzanne-I'm so happy to hear that! Thanks a bunch! finsmom-Great! Hope you enjoy them! I love how refreshing these cookies are. I'm sure the zest of the orange brings some kick out zing to the taste! I love Anita's book, but haven't tried this one yet. Looks like it will be next on my list! Mimi from R.I. said.. These cookies certainly were a "delight". They went to the top of my favorite cookies to make and so easy to make to boot.